CLICK ON ANY AREA on the LOWER FLOORPLAN to see the corresponding photo for this area. 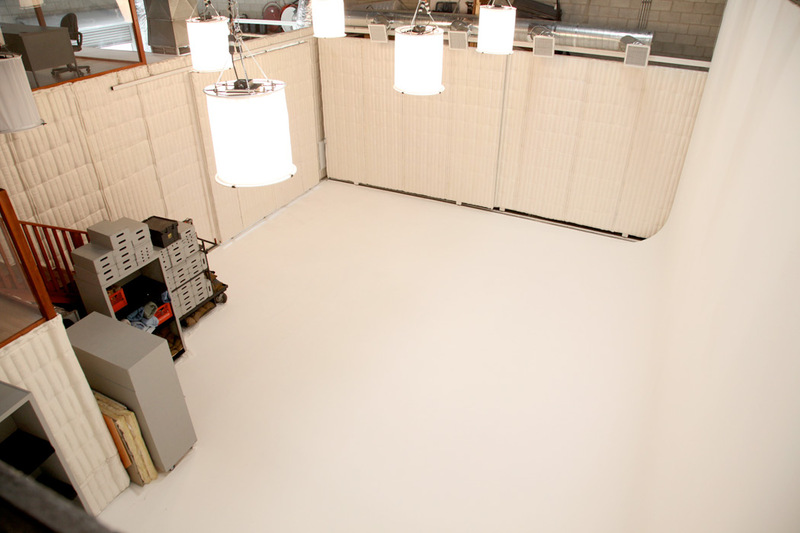 STAGE: The Main Stage features an 18’ height, 2-wall Cyclorama with 36” cove. 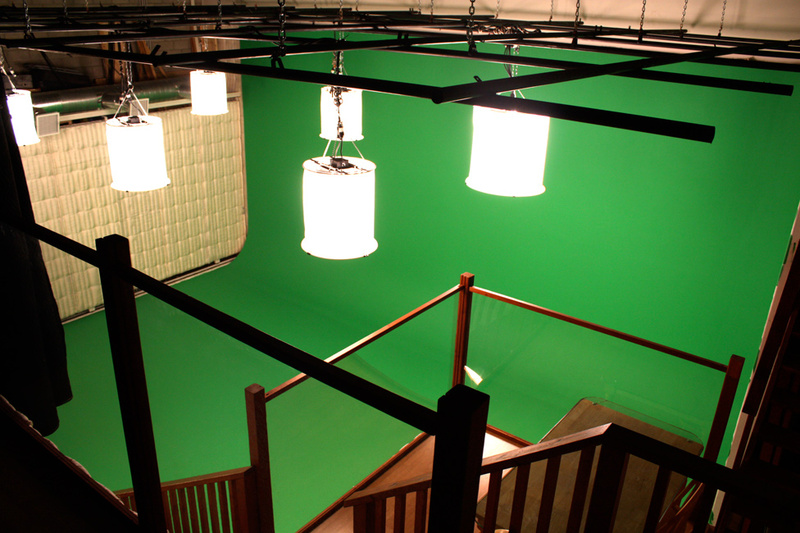 It measures 40’ X 29’ and has a catwalk. The straight-on shooting distance to the center of the wall is 29’and an angle shooting distance to cove of 35’. 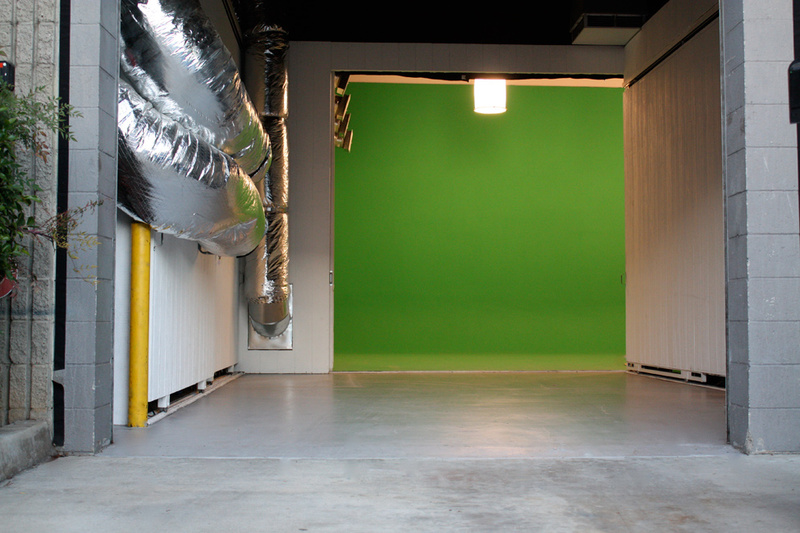 The stage doors can be opened to give the camera and extra 27’ of distance to the cyclorama for a total of 52’. The height of the grid is 19’ and covers the entire stage area. The total height past the grid exceeds 25’ Sound proofing insulation surrounds the entire stage area. 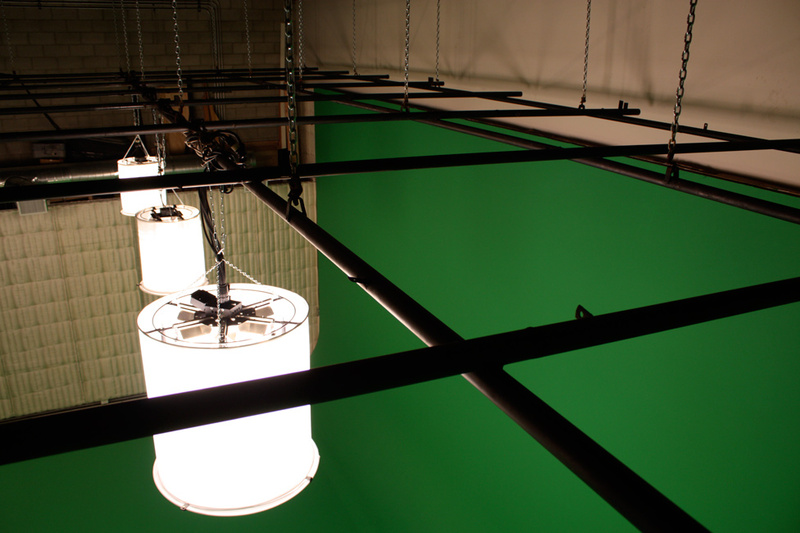 PRE-LIT GREEN SCREEN: The stage is pre-lit with 6 x 2K and 1 x 6K space lights giving a Green Screen Reflective Reading of 100 Candles or 5.6 F-Stop at 400 ASA at 24 Frames. FLOORS: Stage floor is concrete. 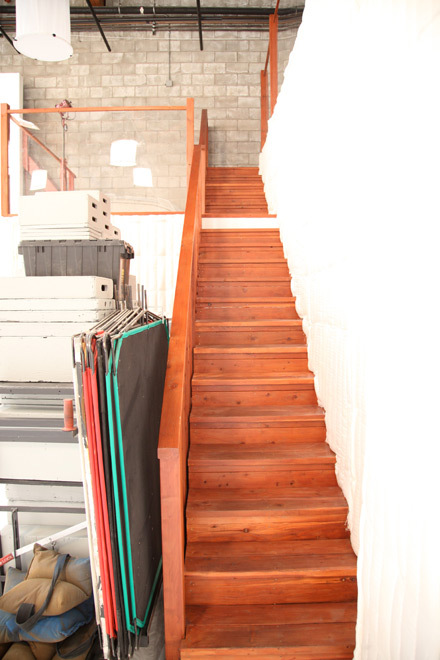 Coming soon will be a 30’ X 20’ rooftop decks with cove and unobstructed views for still photography shoots. On site, our state of the art Lincoln 9-passenger custom limousine has been used to shoot reality shows and is equipped with hidden camera and audio system, which records directly to a 10-hour hard drive mounted in the trunk. Other features include a custom sound system with DVD player, satellite radio, two LCD TV’s and a custom carbon fiber limo bar. This limousine is on site and available to pick up and drop off your talent and is billed as an additional charge. When booking, please have dates and times available for our scheduler. We have available a Red 1973 Ford Mustang and a White 1964 Oldsmobile Delta 88 billed at additional charge. 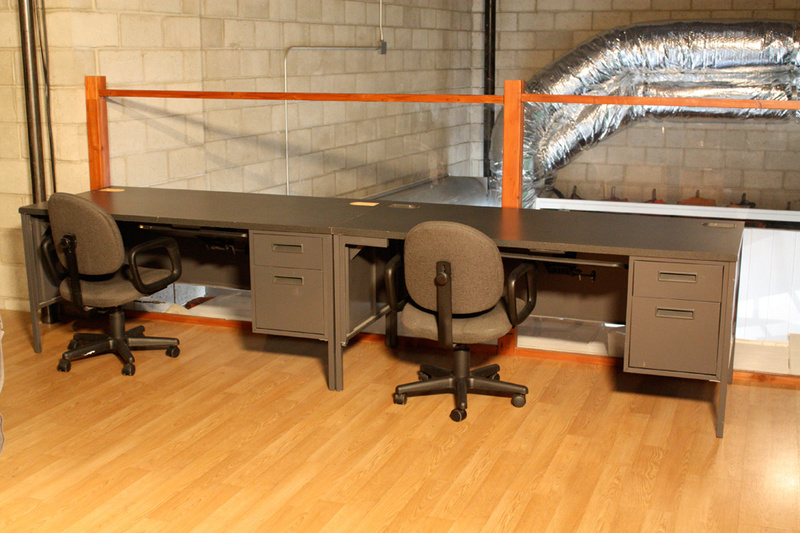 Studio rooms and furniture can be used for your production and additional charges will apply. GRID: Pipe grid covers entire stage. 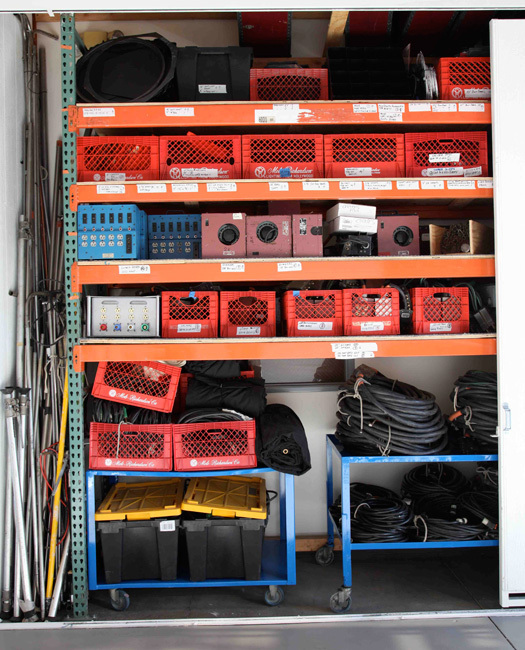 STAGING AREA: A 10’ X 12’ roll-up door serves as our truck loading dock and staging area. The Staging Area Measures, 24’ x 18’ and you can back up your truck directly onto the stage, saving time off-loading and loading. 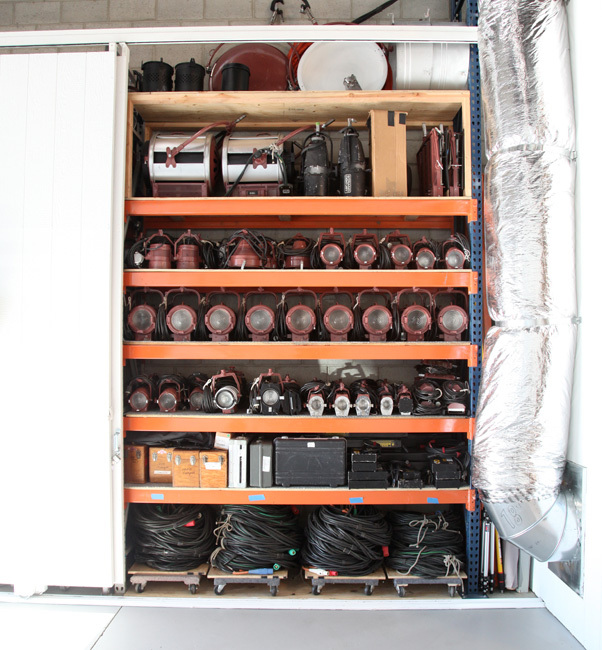 AIR CONDITIONING: A studio approved “Carrier Whisper Quiet” 5-ton portable unit cools the main stage area for great temperature control. There is another roof top 5-ton unit, which cools Offices, Kitchen, Orange Room, and Hair and Make-up and Sky Loft area. TELEVISIONS: LCD TV’s are located in various areas of the studio and have direct feeds from the main stage. KITCHEN: Fully equipped kitchen including refrigerator, microwave, sink, and storage. ORANGE ROOM: This room features two high-end leather couches, 40” LCD TV with PlayStation3 Gaming as well as Blu-Ray player, and wireless internet. The elegant décor makes your talent and/or client feel special. Production Area: includes 2 large desks and seating for 4-production crew. 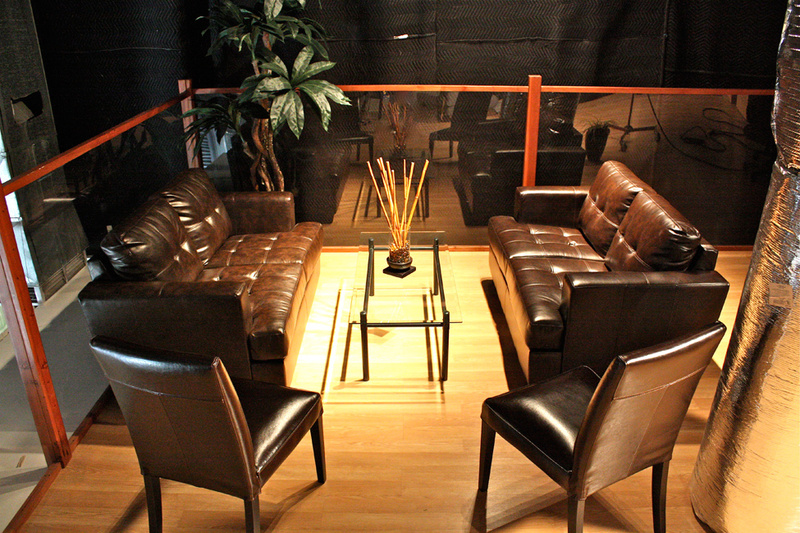 Client Lounge: includes seating for 6 with 2 high-end leather couches and 2 leather chairs. This area has a great view overlooking the main stage. Entertainment Lounge: features seating for 6 with a large LCD TV, DVD Player, and Mini Bar. The loft has various games including pinball and slot machines as well as high-speed Wi-Fi. Optional Cafeteria Setup: Includes folding tables and chairs that can be used for crew lunches, or additional work areas. The Sky Loft is also a great location for extra wardrobe or as a second shooting location or can be equipped with a backdrop to maximize shooting time. MAKE-UP ROOM/WARDROBE ROOM: Includes two main Make-Up Stations with Salon Chairs and option for two additional. 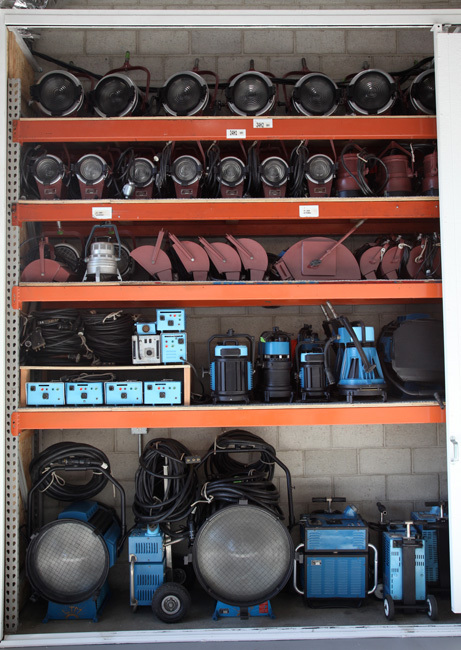 Each station has 20 lights and overhead spots for ideal lighting for both makeup and hair. Additional seating is included in this room by a high-end leather couch. 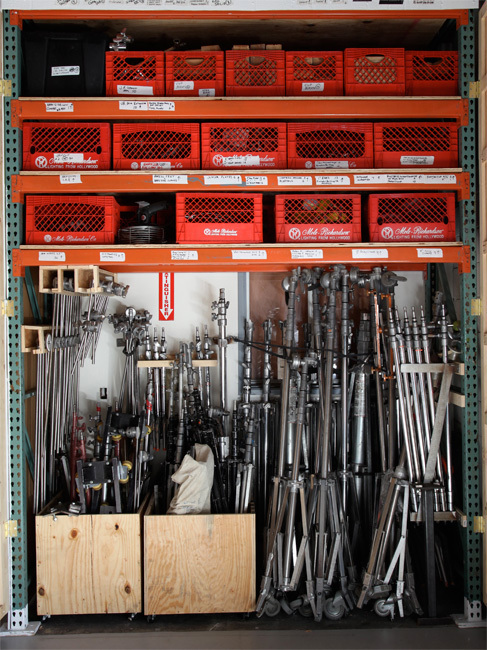 Wardrobe hangar racks are included and a full-length mirror is available. This room measures 12’ x 12’. HAIR SALON: Features a high end Hair Shampoo Station with reclining chair. Two additional hair/makeup stations with director’s chairs and overhead spot lighting are also located in the hair salon. RESTROOMS: There are 2 restrooms located in the studio. The hair salon area also serves as the second restroom. PARKING:Three dedicated stalls are located in our gated security lot. On-street parking is also available as well. There is a Public Parking lot at the end of the block, which can accommodate 100 cars. We also have arranged parking with the Costco shopping center 2 blocks from the studio.